Sad but inevitable. We all have to live. Ah, handy. I'll make a note of that - might come in useful next time arraignment looms . Anyone can help me and tell me what bird this is? If it is around the size of a blackbird, then more than likely a thrush. 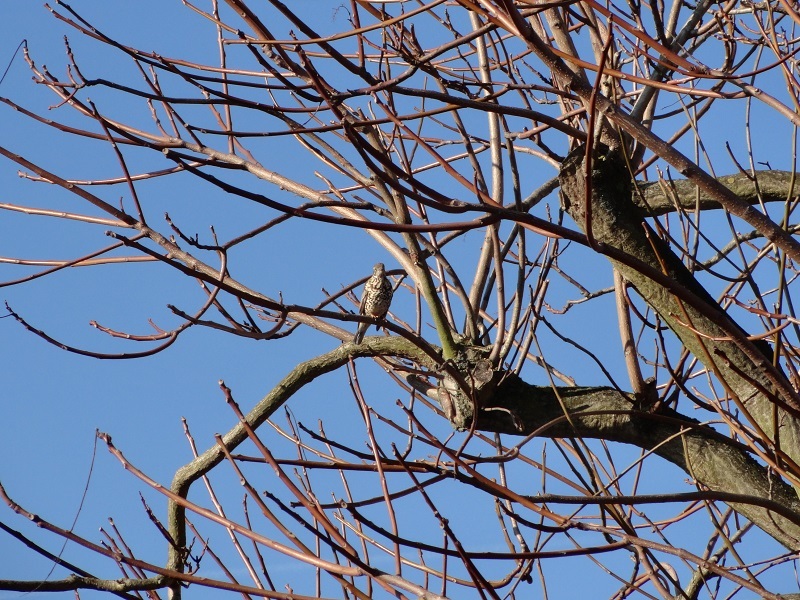 If it is smaller, could well be a tree pipit. My best guess. Back along I put some hard fat slabs in a fat ball feeder. Never had any takers for ages. But lately I noticed that something had been pecking away at it, but never seen what it was. That is until today, a bloomin great rook was hanging from it just now. I wandered what all the flapping was. How the heck it managed to hang on I don't know as it is only one of those small acorn feeders that holds two fat balls. Must have been hanging on the branches of the tree as well.